The towers are occupied by two different bank headquarters. 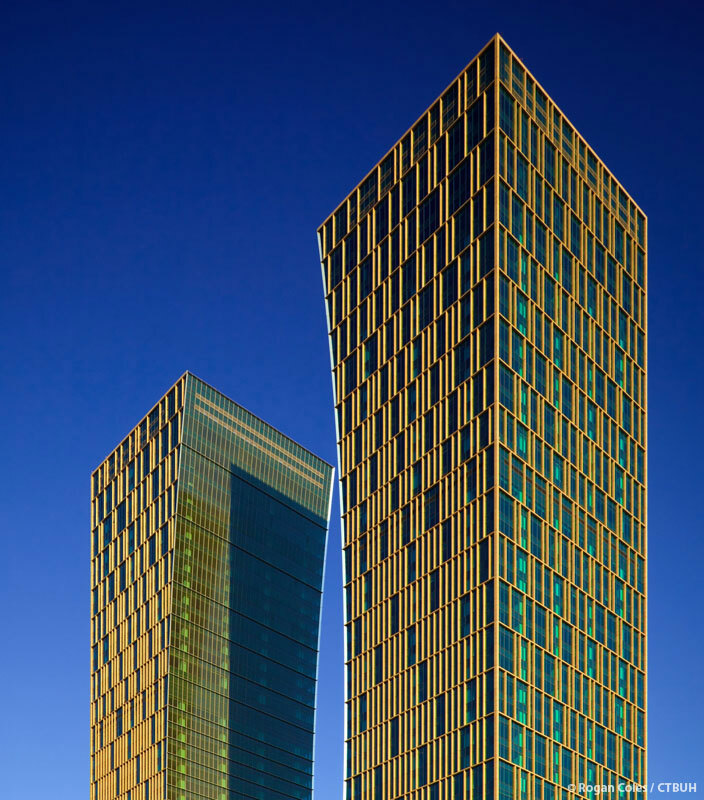 Thus a key element of the design was to create symmetrical towers that are all about balance, order, and stability. Their interdependence sends the message of union and respect for each other simultaneously. 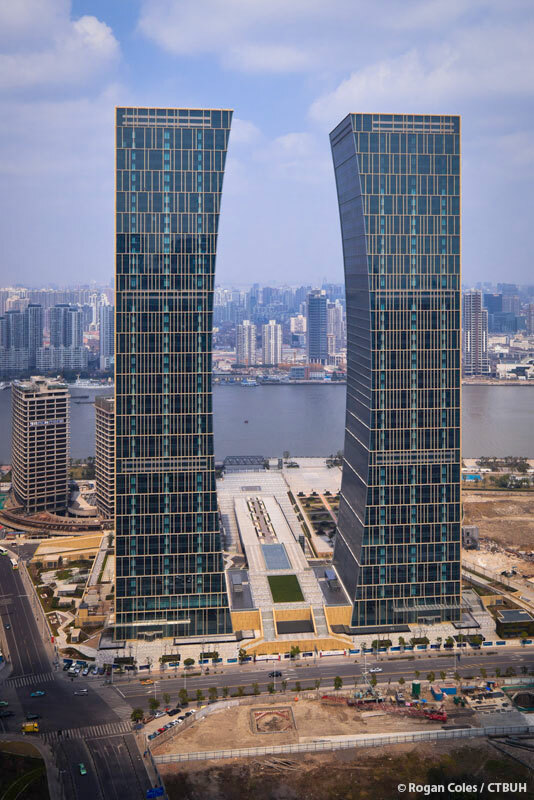 The stone and glass towers rise in tandem to form a gateway to the Huangpu River. 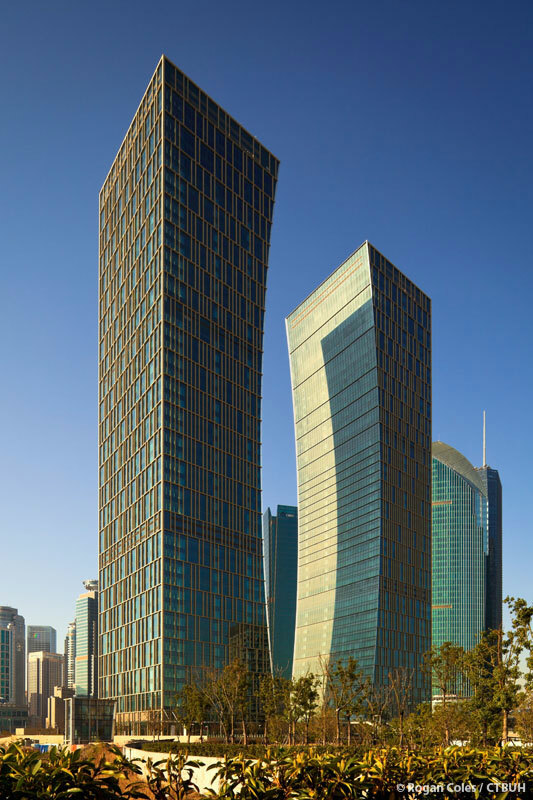 As they face each other, their façades curve dramatically to form an implied space that frames the sky and the city skyline. 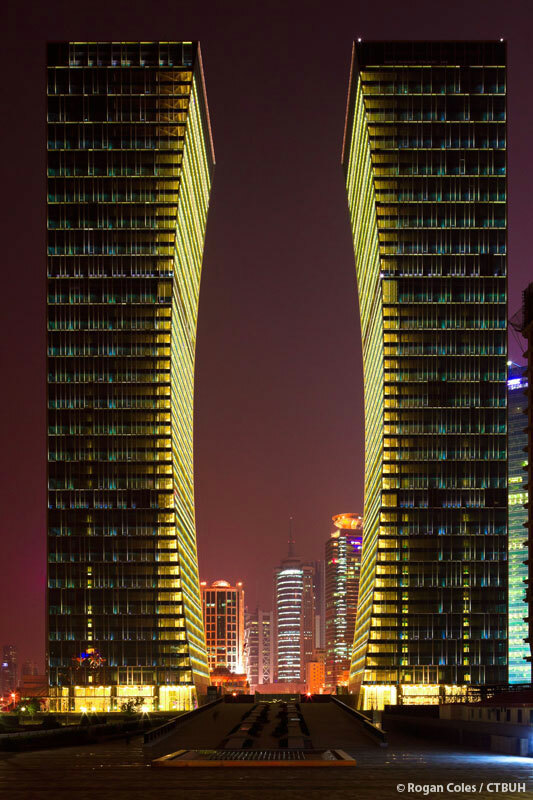 The facing inner curves are lit at night to emphasize the distinctive shape and monumental scale of the space. 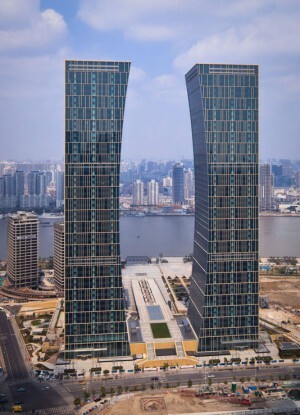 This site is designed with the intention of integrating a high profile urban space within a new state of the art, highly modern business environment. This adds a sense of place, or destination, to an already popular area, where the community can utilize and enjoy the river landscape and partake in various recreational activities. In this sense, the main buildings are interconnected by an elevated platform which serves as weather protection for the indoor pedestrian corridor below, and above provides an outdoor public space. 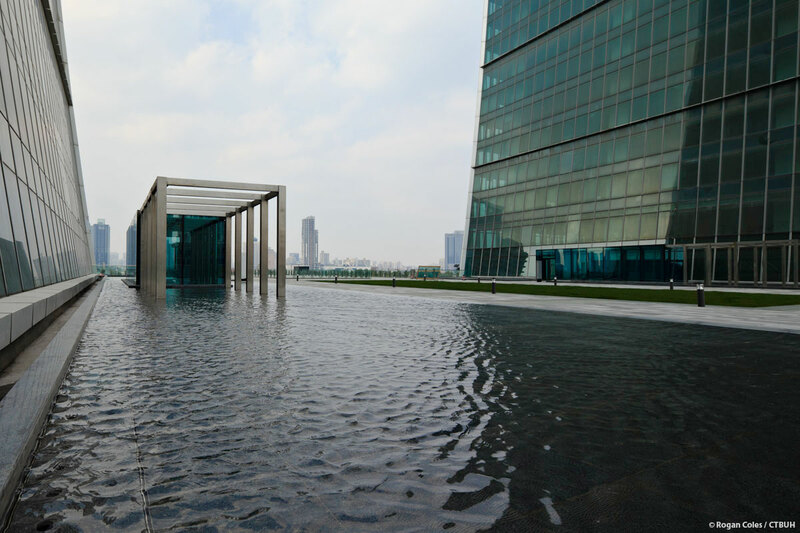 The project created specifically a raised basement level to cater to the height of the Huangpu River’s flood protection systems. 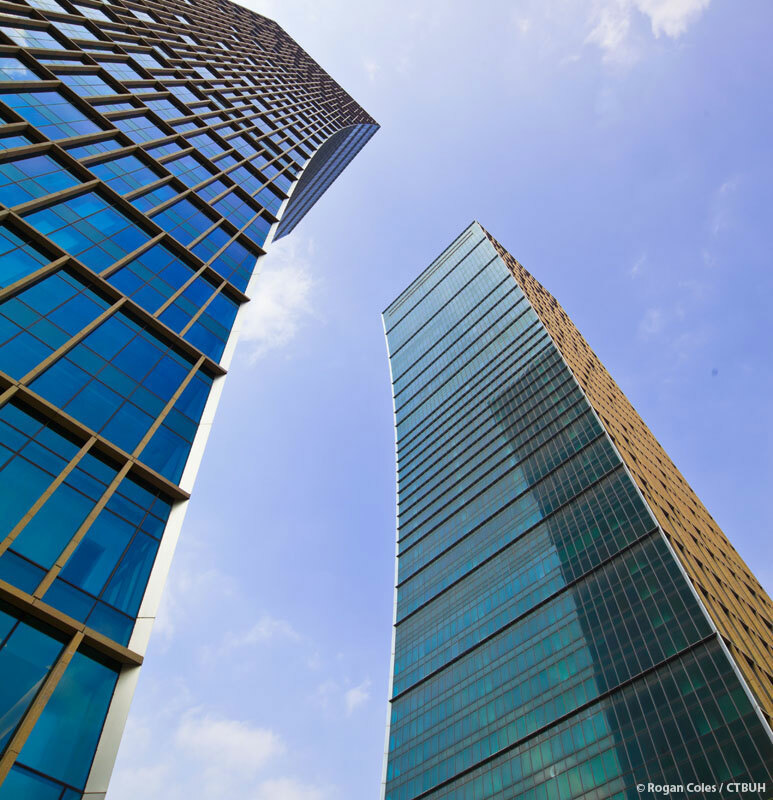 The architectural design is aimed at the needs of a flagship financial tenant, providing an efficient floor plate and special consideration to specialized trading floors and private meeting spaces. 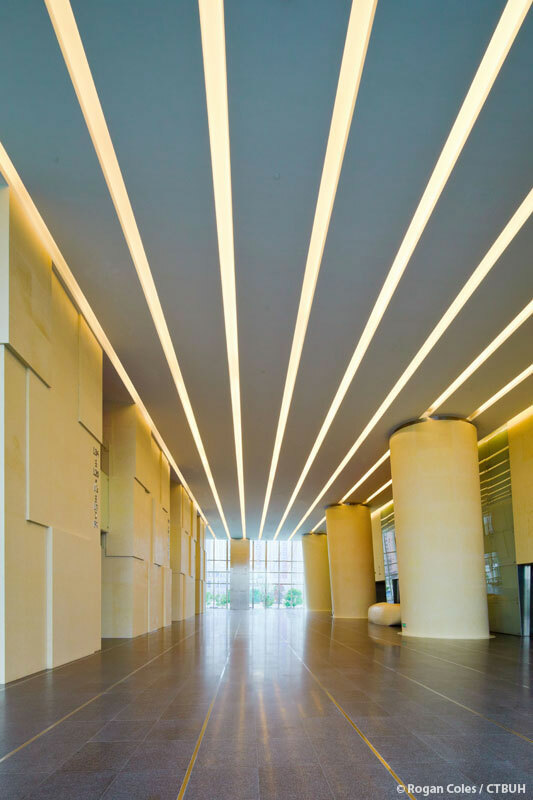 A removable slab area was integrated into the plan to accommodate flexibility for tenant needs, allowing connectivity to floors above and below for larger firms, or these can be kept closed for smaller tenants that will only occupy single floors. 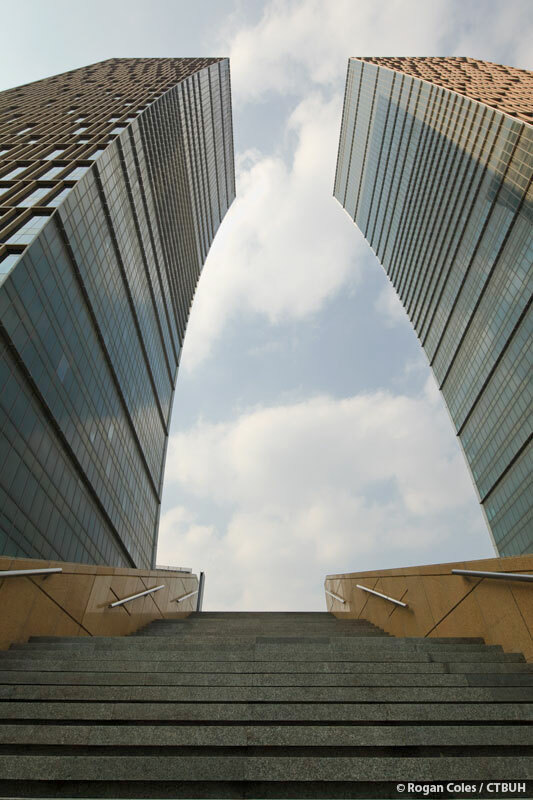 Individual MEP areas are reserved to help ensure the high electricity supply requirements for financial institutions. 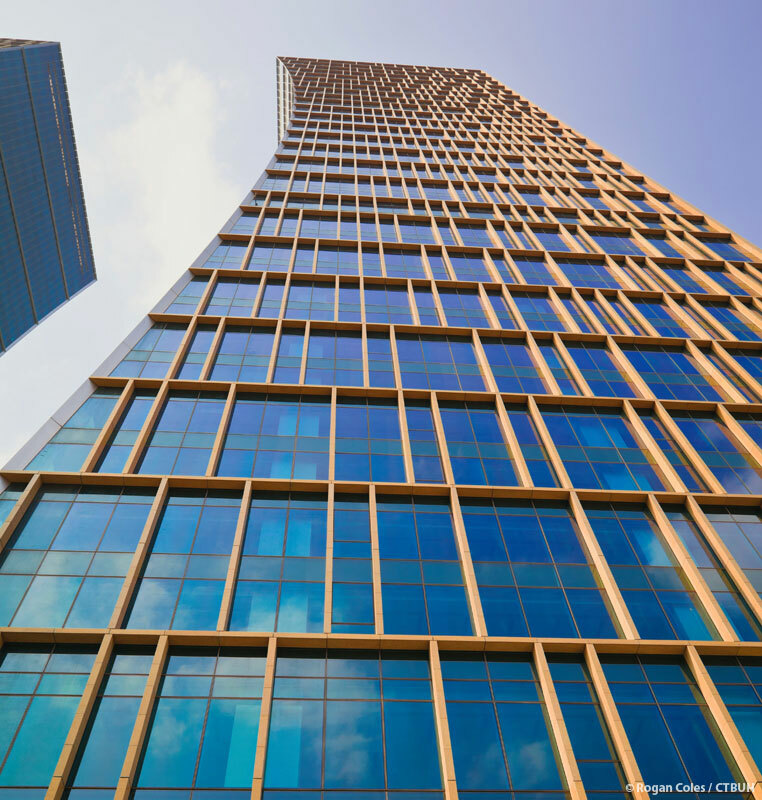 The façade comprises unitized high performance Low-E glass, with solar control coating. 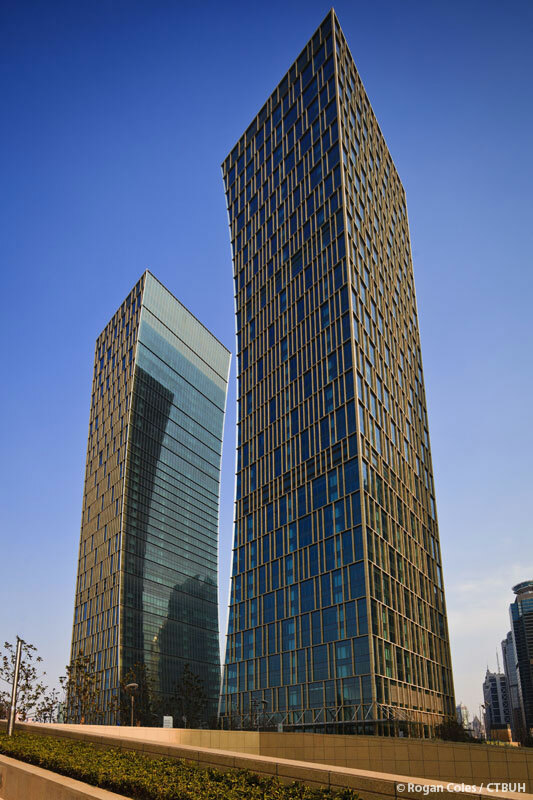 Natural stone and aluminum cladding serve to add a distinctive patterned feature across the elevations, giving the towers a distinctly Chinese feel, and thus further grounding them in their local context. 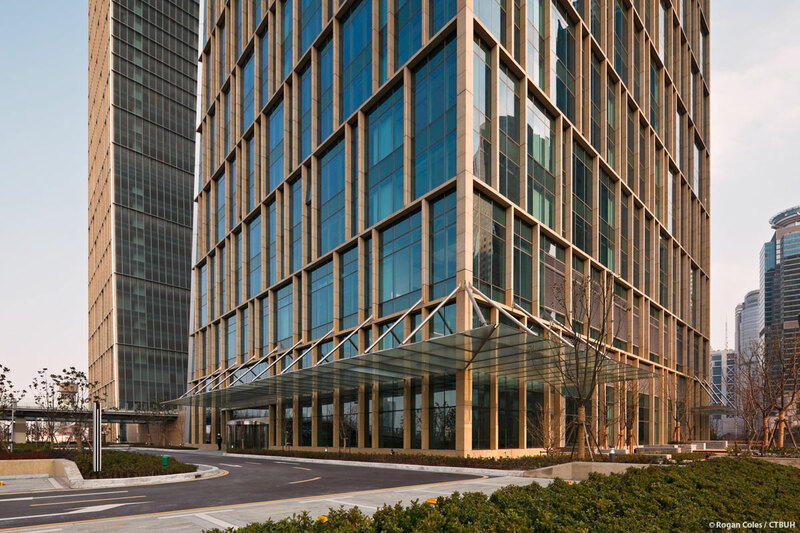 All the façade materials were procured locally in China and are recyclable. A conventional reinforced concrete frame core wall system was adopted for the tower. However, some special structural features have been used for this project. 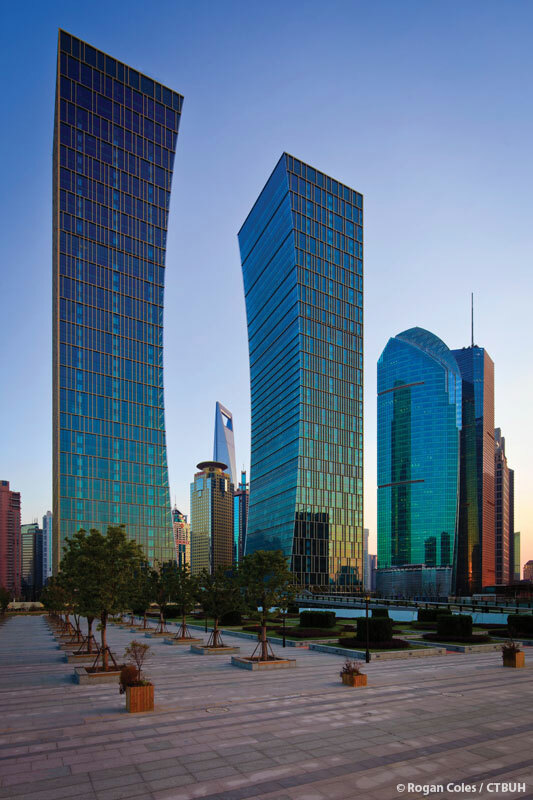 Inclined columns are used at the curved elevations face to face to integrate the structure into the architectural form. Steel Reinforced Columns (SRC) are used in the lower part of the towers to minimize column sections and the lost floor area that would have been needed for larger columns.